Last night I saw The Fault in Our Stars with my friend Becca. We had both read the book so we were skeptical of the movie adaptation (the only problem with being a reader), but it did not disappoint. It's very well done and of course a total tearjerker. Since it's a drama, the movie is generally pretty quiet and at one point you could hear sobs and sniffles throughout the theater. In fact, a lady one row back was essentially bawling pretty much the last hour and fifteen of the movie. And me? Well, I had a few very well placed tears that came out of the corner of my left eye (no mascara smudges!) and felt very in-control of my emotions. I might have come home and eaten a bowl of ice cream by myself, but whatevs. In non-related clothing commentary, I am finally wearing that blue embroidered skirt I bought way back in March. This $19.99 skirt from Anthro was just begging to come live in my closet. And I love it! The scalloped edges, the blue and gold, the not-to-tight pencil fit; all perfect. Now I have precisely 3 Anthro items in my closet. Victory. Cute skirt! I was also surprised that I didn't bawl all my makeup off in the theater. A few tears, but not the waterworks I was expecting! What a gorgeous, gorgeous skirt! Also I am totally avoiding TFIOS because I know I will die from crying. Your hair looks amazing! Gorgeous skirt too, anthropologie always has such fun statement skirts. This skirt is seriously gorgeous, I love the vintage feel it has. I just finished reading The Fault in Our Stars, and now I really want to see the movie, but I already made plans to see it with friends, but that isn't going to be for another 2 weeks! I cannot bring myself to watch that movie because I know I will bawl my eyes out like an idiot right there in front of everyone. I just don't do sad movies. Loving this skirt. That hem is awesome. That skirt is so pretty! I love embroidery! I haven't seen the Fault in Our Stars yet, but I would probably ball my way through it. I feel like I cry at every movie, lol! Great skirt! So pretty! I read TFIOS awhile back when I was still doing programs for tweens/teens (I am a librarian.). I will not be seeing the movie since my dad got diagnosed with thyroid cancer in June. I remember when you featured this skirt in one of your purchased posts. It is very pretty and love the hair. I LOVE that skirt. It goes so well with your heels, too! I totally bawled my eyes out watching TFIOS, but I didn't cry a tear when I read the book. That skirt is so unique and lovely, and I love how you styled it with an elegant, drape-y blouse. Anthros stuff is always so cute! I love this - so pretty and chic! I have been wondering if I should cave and go see the movie. I just didn't want to look silly walking out with mascara all over my face from crying. I can be emotional so this might be a watch at home one! So glad you are wearing that gorgeous skirt! It was an amazing deal and looks gorgeous on you! I love everything about it! That skirt is gorgeous, Ashley! And I absolutely love the way you've styled it with white top and tan pumps. You will probably have those 3 Anthro items forever! I pass my Anthro collection back and forth between me and my mom because we swap sizes all the time. Do you have a store near you? Things often times get super cheap in the store. Most of my skirts I've picked up for $10-$20 in store at key times. I've also had my favorite one since 2003, so there's that too. This skirt fits you like a dream! Money well spent. Also... I am not in control of my crying so I hope to never see that movie. gorgeous skirt! I am very skeptical of the movie as well, I mean how can it be good? might wait for the DVD, because I can guarantee I'll be like the lady behind you. Mascara smudges for me. My daughter read the book and has been asking me to take her to the movie! So glad to hear you liked it! 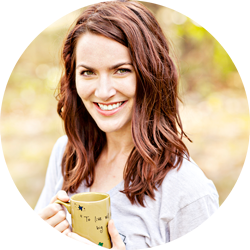 Love your Anthro skirt and what a deal! My eye was immediately drawn to the skirt and its scalloped edges. So pretty and flattering! I was a sobster while reading the book so who knows how I'll hold up through the movie. Since I've fallen in love with my husband I've become such a sap. It's way too easy for me to imagine us in these tragic roles and then there's nothing I can do to stop the tears! 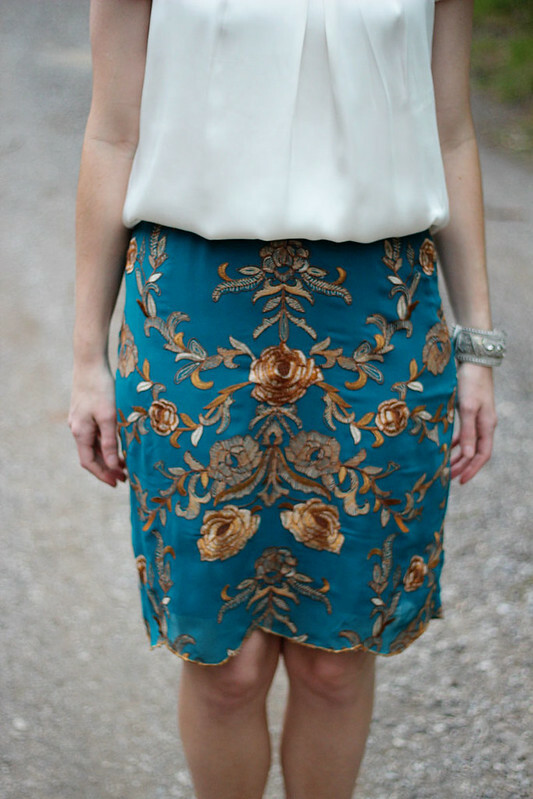 I love the detailing in that skirt and it's such a pretty color. Great find! And I've heard so many stories just like yours of that movie, just utter silence and then sobbing. I've been intrigued by the book, but honestly just haven't ever been in the mood to be like 'Okay, now I need to read something really depressing!' Maybe someday? That is one beautiful outfit!! 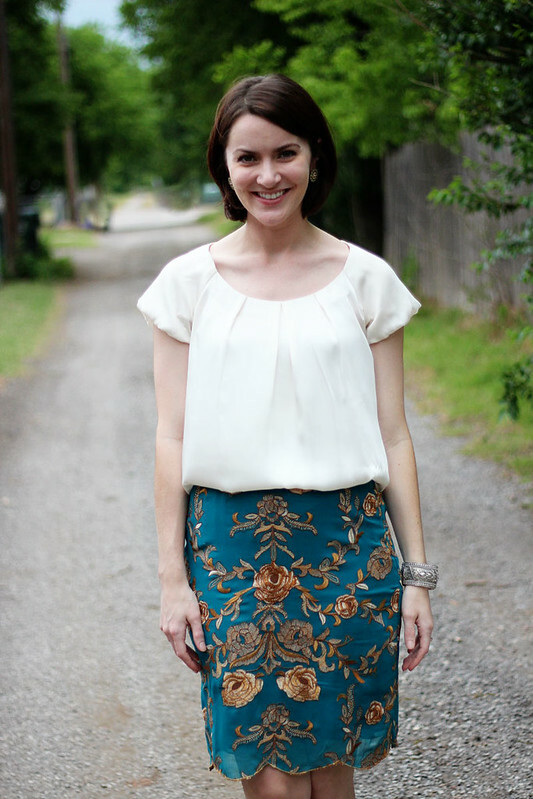 I love the pattern, scallops and shape of this skirt. It looks perfect on you!! Wear it a lot this summer :) Oh and I love that you are slowly but surely growing the Anthro section of your closet. It's one of my goals, too! Aww, this skirt is so pretty - I really like the colors especially. And that top is beautiful as well - what a great, versatile piece! I haven't read TFIOS yet, nor have I seen the movie...I can sometimes be quite the cryer, so I might wait until it's on Redbox so I can cry comfortably in my house, hahaha. That skirt is gorgeous. Wear it more often. I have zero items from Anthro lol. And I want to see that movie BADLYYY!! I almost bought a top just like yours this past week! (But it wasn't a perfect fit, so I passed.) I can't wait until I have a big girl job and can afford shopping at Anthro. The closest one to where I live never seems to have anything on clearance in my size! Aww I loved that movie too! I thought the acting was really good and I definitely cried more happy tears than sad tears which is what happens when I watch movies, proposals on YouTube, etc. That skirt is INSANELY gorgeous!! My jaw literally dropped when I saw how much you paid for it. Lucky duck!